And so begins Kieran McCarthy in his book Family Business: A Survival Guide, with a nod to the Irish public’s conflicted attitudes towards family enterprise. “On the one hand, it inspires trust and brand loyalty; on the other hand there is a tendency to see family business as a lesser operation than a multinational,” he writes. But from the onset, McCarthy, the accountant son of two entrepreneurs, makes clear both the importance of family businesses to Ireland, where they account for about 75% of all enterprises, and some potential pitfalls – like the potential for nepotism. “If the Irish family business sector collapsed in the morning, the backbone of the country would be gone and the entire economic system would collapse in the same moment,” he writes. The book, which is being published by Chartered Accountants Ireland, is aimed squarely at those already running a family enterprise – or considering setting up one. While much of the advice contained in its pages is general and could be applied to any trade, family-business owners looking for a single, go-to guide are the main ones who would benefit from a read. To begin with, McCarthy sets out some key steps business owners can take to help their bottom lines and keep their sanity. These include things like marking out clear boundaries between the workplace and home life, and making sure the business stays viable even if that means some family relationships suffer in the short term. Of all the potential flashpoints McCarthy sets out, sibling rivalry and fraught parent-child relations are the deepest pitfalls entrepreneurs need to avoid. He gives tips for conflict resolution and communicating within the family – although this advice is fairly generic, like agreeing to disagree and “practising empathy”. Another section of the book deals with the issue of retaining staff and the tough task of building “inclusion” in an environment where non-family members could easily feel left out. “By bringing non-family employees into the fold, family businesses can create an environment of ‘extended family’ which non-family businesses will find difficult to rival,” McCarthy writes. The author delves into ways of avoiding the perception that family members are getting preferential treatment, like making sure the pay packets for all staff are closely linked to performance. And for a book about family business, McCarthy rightly spends several pages on the benefits of enlisting outside help for “professionalising” enterprises. Without these steps, he says, the growth of many businesses can be stunted because family members lack the skills to keep driving development. His advice culminates in nine steps he says are needed to run a successful family business and a warning note that about a third of all family enterprises fail within the first three years, while only a fraction make it to the third generation. In a nutshell: Family connections can be the foundations of the strongest businesses, but getting it right involves striking a delicate balance between looking after relationships and keeping things strictly professional. 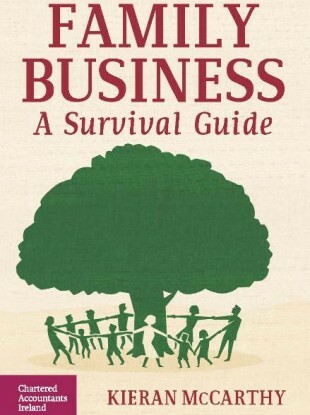 Email “SME book club: Surviving a family business... with your sanity and relationships intact”. Feedback on “SME book club: Surviving a family business... with your sanity and relationships intact”.